Vitamin D deficiency is a global pandemic, and the clinical impact is far-reaching for pediatric and adult patients. In this video, Dr. Sara Gottfried discusses the US Endocrine Society guidelines for vitamin D sufficiency and explains the differential impact of vitamin D2 vs. D3 supplementation on serum 25-hydroxyvitamin D levels – 25(OH)D. Next, she provides insights on the synergistic role of vitamins D and K in bone and cardiovascular health. Since both of these essential, fat-soluble micronutrients are major nutrient gaps, Dr. Gottfried explains how the concurrent supplementation of vitamins D and K offers an elegant solution to fill the gap for these two key nutrients that work together in the body. Are your patients getting enough vitamin D? According to the National Center for Health Statistics, 3/4 of US adults are deficient in vitamin D. However, the problem’s not limited to the United States. I’m Sara Gottfried, MD – a board-certified gynecologist, author of three New York Times Best Sellers, and the President of Metagenics Institute, the educational arm of Metagenics. For the past decade, vitamin D deficiency has been identified as a global pandemic. For most humans, sun exposure in moderation is the major source of vitamin D. Very few foods, even those that are fortified with vitamin D, are sufficient for a child’s or an adult’s vitamin D requirement. So, we are seeing increased risks of rickets in children and in adults, greater prevalence of osteopenia, osteoporosis, fractures, common cancers, autoimmune disease, hypertension, and infectious disease. According to the Endocrine Society, sufficiency is defined as a circulating level of 25-hydroxyvitamin D [25(OH)D] of greater than 30 ng/mL, which is required to maximize vitamin D’s beneficial effects on health. In the absence of adequate sun exposure, supplemental vitamin D3 might be needed to achieve sufficiency in children and adults. These are the topics that I want to cover with you today, including answers to the questions that I most commonly get from my patients. The first question is about vitamin D2 vs. D3. We can all agree that vitamin D sufficiency is crucial to overall health, but what’s the best strategy for your patients? Allow me to share two studies with you on this topic. 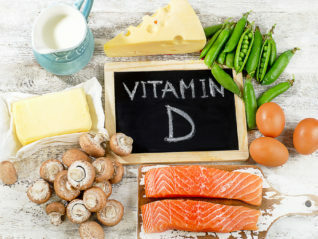 First, there was a large meta-analysis of seven intervention studies that included over 1,000 participants aged 18 to 97 that showed that vitamin D3 supplementation is more efficacious than D2 at raising serum vitamin D levels. The second study involved 107 subjects and it tested the effects of supplementing with 2,000 IU of vitamin D2, versus vitamin D3, versus placebo during an 8-week period on the serum concentrations of 25(OH)D, 25(OH)D2, and 25(OH)D3. In the vitamin D3 supplementation arm, the concentrations of 25(OH)D3 increased significantly from 16.6 ng/mL at baseline to 35.3 ng/mL after 8 weeks; meaning they doubled in two months. We like that, true? On the other hand, 25(OH)D3 levels decreased from 15 ng/mL at baseline to 12.5 ng/mL after 8 weeks in the placebo group. That’s not good. In the group receiving vitamin D2, the 25(OH)D2 levels increased significantly, but the 25(OH)D3 levels decreased from 14.6 ng/mL at baseline to 6.7 ng/mL after 8 weeks. One of the possible explanations for this occurrence can be attributed to the possibility that D2 impairs hydroxylation of D3 in circulation. Therefore, based on these results, we can conclude that vitamin D3 increased 25(OH)D more effectively than vitamin D2. The next question I often get is why should we consider vitamin K? Without sufficient vitamin K, vitamin D may not live up to its full potential. You can think of vitamin D as the superhero and vitamin K as the sidekick. Together, they are more effective. Both vitamin D and K are essential, fat-soluble vitamins with interdependent activities beyond the benefits of vitamin D. Vitamin K is required for the production of several key proteins that are involved in calcium and blood coagulation homeostasis. Specifically, vitamin K plays a central role in decreasing calcium absorption in the smooth muscles of vascular walls. Studies have shown that adding vitamin K to vitamin D induces mineralization in osteoblasts, or bone-forming cells, reduces bone loss, and in post-menopausal women, can lead to more favorable changes in bone metabolism and also bone mass when used along with a calcium intervention. While vitamin D deficiency is a widely acknowledged epidemic, vitamin K is another important nutrient that is poorly absorbed from food and might be missing from your patients’ diets. A growing body of evidence supports the synergistic interplay of these two essential nutrients. Vitamin D and vitamin K are both involved in the support of healthy bones. Vitamin D supports the mineralization and healthy structure of bones, while vitamin K is the key for the metabolism of bone proteins that are crucial to bone integrity. Research has shown that vitamin D helps stimulate the production of vitamin K-dependent proteins, and that’s what supports the bone mineralization and may also support vascular health. Together, these important nutrients may provide a synergistic approach to both bone and cardiovascular health. With busy, demanding schedules that require long hours indoors, it can be challenging for your patients to get enough vitamin D through sunlight alone, especially during the winter months when living in certain climates. And with poor bioavailability in food that’s not easily stored in tissue, vitamin K may also be lacking – that’s why supplementation can help. D3 is proven to be the most bioavailable form of supplemental vitamin D, making it an ideal option for those who need extra support. In combination, vitamin K2 has been shown to be the most beneficial form of supplemental vitamin K. Where diet and lifestyle fall short, supplementation can provide convenient support for your patients’ health. So you just learned a lot, but understanding this type of information about the synergy between vitamin D and K and how they should be prescribed together, is what I hope you find helpful in your own practice. To learn more about supplementation with vitamins D and K, visit MetagenicsInstitute.com. We’ve just published multiple reviews on the latest science on vitamin D and K, complete with citations.